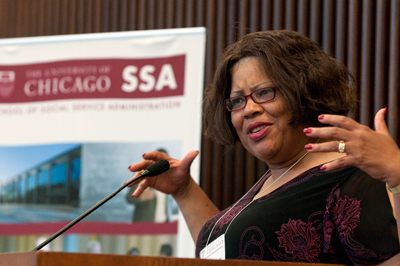 When St. Anne's Hospital closed in 1988, Jacqueline Reed was busy as a third-year extended evening Program student at SSA, a fellow at the Chicago Community trust and a mother raising four children with her husband, Ronald. But Reed knew that with St. Anne's gone, her community of Austin, a predominantly African-American neighborhood on Chicago's West side, would be without easy access to affordable health care. And she decided she needed to do something about that. Reed, AM '89, started by examining the causes of hospital closings, which led to advocacy for innovative solutions. The grassroots movement she helped create led to an even wider set of programs. Today, Reed is the CEO of the Westside Health authority (WHA), a community-based organization in Austin that she founded and built from the ground up. Her interdisciplinary approach of combining on-the-ground research with a sophisticated understanding of the integration of programs and systems has led to an organization that offers health care, job training, housing assistance and more. Sociologist Claire Kohrman, Lab '52, who has gathered data with Reed and WHA for nearly 20 years, says that she's gratified for the experience. "Jacqueline Reed's agency is built on the responses from the community rather than on theory—and this allows WHA to build on the strengths and assets of the community," she says. "She has a spiritual and missionary-like commitment combined with sophisticated skills from her SSA training that make her remarkably effective." WHA's strength comes from community organizing, such as the Cornerstone Project "Every Block a Village," which harnesses the collective assets of the neighborhood. Through the program, WHA has developed substantial relationships with citizen leaders on 100 blocks in Austin and has reached out to 200 more. Every Block a Village equipped local residents with Internet access, orchestrates meetings and holds potluck dinners to build a sense of trust among neighbors. Since its inception, many Austin residents have decided to not leave the neighborhood, investing back into their properties instead. "Community needs to be built everywhere—in poor and wealthy neighborhoods. It's what we collectively struggle with in terms of improving our schools, ending violence, and building tolerance and understanding of one another," Reed says. The Westside Health Authority began because Reed thought Austin residents needed a voice in their health care. "I wanted to return to this community better equipped to help people understand some of the macro level needs. What is happening in health care? What are the implications of policies that are impacting our communities?" she says. Located just seven miles west of downtown, Austin was devastated in the 1970s and '80s by the closure of major factories, including Sunbeam, leaf Brand Candy and Aldens, and Reed was keenly aware that the community's priority was job retention and creation. "It was not until the closure of St. Anne's that people organized and became engaged in health care," she says. "St. Anne's was a major community institution, which represented neighborhood stability." After a public meeting about the closing, chaired by Reed and attended by more than 300 people, she worked with two local community groups that shared her vision to bring the kind of health services needed in Austin without the added cost of a large inefficient hospital system and facility. She organized a breakfast at a ministers' coalition meeting, persuaded local clergymen to donate $40,000 for the purchase of a building, solicited a matching grant from churches, and found tenants for the building to assist in paying the mortgage. WHA organized a consortium of medical providers at the site, which included many Chicago hospitals. 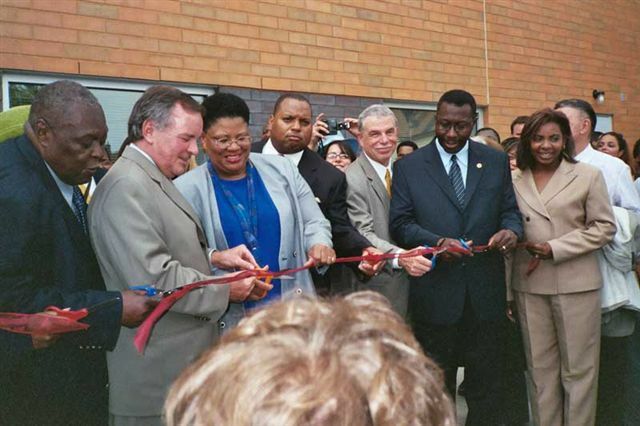 In 1991, university of Illinois opened its first off-campus clinic at the former St. Anne's hospital, and three years later, Cook County opened a small clinic there as well. Although the university of Illinois clinic eventually closed, several community residents were hired and remain employed at the main campus. And thanks to its community infrastructure, WHA quickly absorbed the loss through the expansion of the Cook County Clinic, which later met an increasing demand for primary and specialty services with a 28,000-squarefoot Austin Wellness Center facility that opened in 2004. "Through the Austin Wellness Center, not only have we been able to help people understand the reality of health care services today," Reed says, "but we have been able to help people take some responsibility for creating the type of facility and sustainable services that meet their needs. In fact, the first $60,000 for the facility was raised by the people themselves. as a result, we have also been able to provide jobs and develop businesses for community people." more than 55 percent of the construction contracts to build the Wellness Center were with African-American contractors, and 80 percent of the jobs went to local residents, returning approximately $2.8 million back into the community. Bolstered by their success, Austin's community groups examined ways to expand health care services. Community providers and local residents created strategic plans together to promote health, and prevent the chronic diseases affecting Austin, such as obesity, heart disease and breast cancer. Current programs include daily fitness classes and health seminars, as well as a partnership between several Chicago-area universities and stronger Cook County Hospital to hire community residents to teach medical professionals about their community and communicating with patients. Very early In Westside Health Authority's development, Reed expanded the vision of community and individual health. For example, for years Austin had not seen its children playing in its parks. Now, WHA engages men in the community as coaches and mentors in three baseball leagues for children of different ages. "This is what we call community: People uniting together around the socialization of children, the protection of older people and supporting local businesses. We think that through that kind of mechanism, 'Every Block a Village', we can shape our future in a more positive way," Reed says. WHA now boasts 54 employees, six storefront buildings and 21 subsidized apartment units. At the Community re-entry Center, more than 4,000 ex-offenders annually take advantage of a wide variety of services, including a fully functioning computer lab, voicemail, barbers, job coaches and referrals for ongoing services. The program is being used as a model around the country. WHA also operates a community support advisory council of people whose children have been incarcerated. More than 8,000 local students have used WHA's Technology Center to learn computer skills and take workshops on topics such as writing a resume. In partnership with the City of Chicago's Department of Family and support services, WHA is placing about 35 people in jobs each month. The Austin Safety Net Works, a violence prevention coalition organized by WHA, operates a volunteer network to implement peace-making strategies and promotes programs such as a recent stop Violence against Women campaign. WHA's many accomplishments are largely attributable to the power of the residents themselves. Women in the community served on Cook County's Health advisory board and sold catfish dinners as a fundraiser to show a level of commitment that launched the campaign for the Austin Wellness Center, for example. WHA has connected doctors with citizen leaders via emails to discuss health issues and connected volunteer mental health professionals with residents to discuss ways of reducing stress. Reed believes that many communities have long been dependent on outside professionals rather than solving problems from within. "This community has many wonderful attributes, which can be useful in solving its own problems. I like to describe them in terms of assets, and a huge asset is the common vision and hope of the people. This builds all of our hope for our future," Reed says. Reed was able to build the WHA, in part, through the use of hard data to convince local policymakers and foundations to support their efforts. To gather that information, Reed and Kohrman developed a research model in 1992 in which people from the community were trained in research methods. After surveying, the participants reported the information back to the community, not only to academic audiences. Back in the early 1990s, this approach was rare, but now, community-based participatory research (CBPR) has become a well-respected research method. "Our first research project indicated that stress was the biggest issue," Kohrman says. "For example, over 60 percent of surveyed community members had witnessed drug dealing on their block, over 55 percent were concerned about the safety of their children, and over 50 percent had personally witnessed violence." WHA advocates used the data to advocate for safe places, jobs and basic services in the community. Residents have also shared their information with doctors working in Austin and people from other countries have been interested in speaking with community residents and Kohrman about their findings. "Mrs. Reed and Dr. Kohrman allowed us to go into fields that we wouldn't have been able to go into," says Patricia Wright, an Austin resident who became a researcher/interviewer for the University of Illinois at Chicago's research laboratory via her training at WHA. She now works for WHA as a community health advocate. "I would never have been a community researcher without them." Reed credits her training at SSA, as well as the relationships and access to resources she developed at the school, with giving her the leverage to provide a voice of leadership, including during the first years of negotiating a new health clinic. "I was actually implementing some of the strategies I was learning at SSA on how to advocate and negotiate with power-brokers," she says. Last June, the SSA African-American Student Association awarded Reed with the Alumni of Color award. Reed says she's pleased to see that young African Americans are coming back to Austin to work in the neighborhood. Reed's own son and daughter, an attorney and financial analyst respectively, are now working at WHA. It's important, she maintains, that students who are interested in starting their own nonprofits and working in community advocacy have experience in the communities where they want to work. "I worked for three different West Side organizations, Bethel New Life, Westside Holistic Family Center and Trinity Resources Unlimited, before I branched out on my own," she says. "Students need to know that they don't have to ultimately work for a large organization. We need people with all kinds of skills working in their home communities and becoming part of its fabric." To learn more about the Westside Health Authority, visit their website.